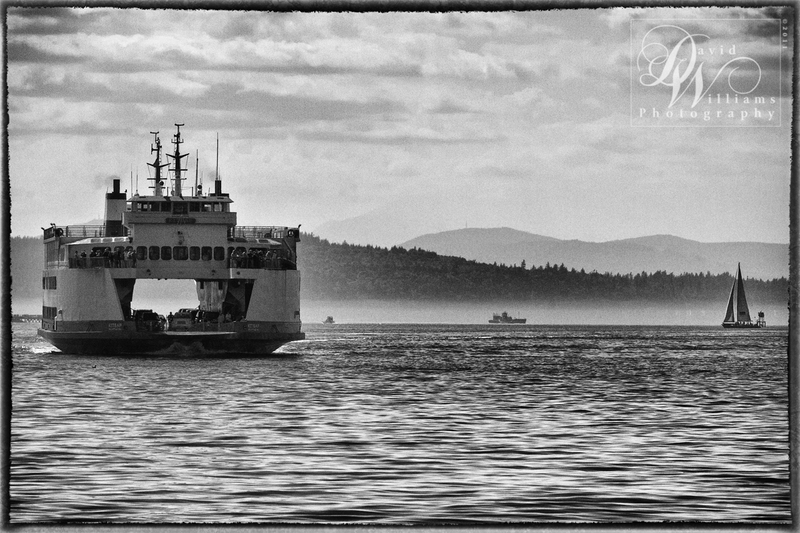 The Washington State Ferries system is the largest in the Unites States boasting 23 vessels, the MV Kitsap is one of them. She was built in 1980 and is 328 feet long with a draft of 16 feet, 6 inches. She can hold 1200 passengers, 124 vehicles and 26 commercial vehicles. Great shot David! Love the processing, and the touch of grain in the image. Very nice shot. I like the B/W processing. Very iconic west coast image – nice shot. This is a great shot – I love the contrast between the Ferry and the sailboat, and the background landscape and sky is just amazing. Great composition and processing, love the tonal changes from the clouds to the water. Nice shot David and I really like the B&W post processing. wonderful shot, but I don’t care for the boarder. The image is superb, well lit and contrasty. I want to launch an expedition with this ship.What an impressive photo. Nice shot w/the 7D. Thanks for sharing. Thank you for stopping by and commenting Mark, hope you enjoyed! Beautiful black and white image. Keep up the great work. I too love taking the ferry whenever I visit Seattle. I really like your new logo. If you don’t mind my asking, how did you create it? Thats beautiful! I love seeing photos so close to home.